Unmanned aerial systems (UAS), more commonly known as drones, have infiltrated the geospatial world. And that’s a good thing. Companies already rely more on drones to capture aerial images and video that produce invaluable spatial data instead of helicopters or fixed-wing manned aircraft, both of which are more expensive on a per mile or acre basis and much less environmentally friendly. The upstart in geospatial data is the processing of aerial thermal data and digitization of assets across multiple applications. First, a quick overview of thermal, or infrared (IR), sensors or cameras: These non-contact sensors detect IR energy (heat) and convert it into an electronic signal. Through digital processing by companies such as FLIR Systems (FLIR), the electronic signal produces a thermal image that include different types of data. The most common type of data used in geospatial applications are temperature differences or radiometry. Operators and data analysts precisely quantify heat measurements from IR cameras to accurately monitor thermal performance as well as identify and evaluate severity of heat-related problems. Surveying experts with one or two drones as well as enterprises managing a fleet of assets deploy the devices with visible spectrum cameras, IR cameras or both to capture valuable spatial data. Data acquired through these sensors during photogrammetric surveys is converted into orthomosiacs, elevation models, contour lines, volumetric measurements, and much more. The ability of thermal data to display temperature differentiations over a large area provides greater context for stakeholders when making decisions that may impact the bottom line of their overall operations. Thermal images can instantly identify defective or inefficient panels based on temperature differences. Cells on photovoltaic modules, entire modules or even sets of modules (known as strings) appear hotter than those that are performing as expected. Thermal images taken over commercial and industrial buildings can identify a multitude of issues that are invisible to the human eye. Operators that have deployed conveyor systems extending tens of miles on active work sites rely on drones armed with thermal cameras and large scale orthomosiacs to identify and geo-locate heated roller bearings underneath conveyor belts to perform preventative maintenance and avoid unplanned downtimes. Utilities realize multiple benefits by using thermal drones for substation inspections, including significant cost-savings, increased safety and immediate results. The IR spectrum is optimal for tasks such as evaluating crop health, over saturation, plants under stress, diseases, biomass analysis and invasive weed identification. As thermal data from drones become more common, surveying businesses and enterprises alike face the same challenge: How do you manage and work with the data? New processes and tools must be developed to store, access, analyze, interpret and act on this valuable new source of information. Compared to a high-resolution image from a visual spectrum camera, a high-resolution 640×512 thermal image with 327,680 pixels is less of a data storage, access and processing burden than typical visible camera files. Even with 14-bit radiometric data, a high-resolution thermal image is only around 780k file size. So, for an orthomosiac flight that captures a dataset of 400 images, you’re looking at a few hundred MBs of storage instead of a few GBs for high-resolution images. While it may seem like an advantage that there is less data to manage, keep in mind that most operators capture thermal AND visual data simultaneously. Therefore, the thermal image data may put an additional burden on the storage and management resources that operators are already using for visual spectrum images. Because the data is only valuable if it’s easy to work with, having a strategy in place to handle it is absolutely essential. It’s not enough for drone operators to be good pilots capable of capturing the proper imagery for the application. Hardware is only part of the equation. Software is where the new thermal data set insights come from. With advancements in artificial intelligence (AI) and machine learning, the market is expanding for many types of players. For example, at FLIR, the world’s leading thermal imaging company, we develop IR sensors, but also work with integrators to bundle them on drones and develop software platforms for flight control, real-time communications, live video streaming, asset management and compliance assurance. 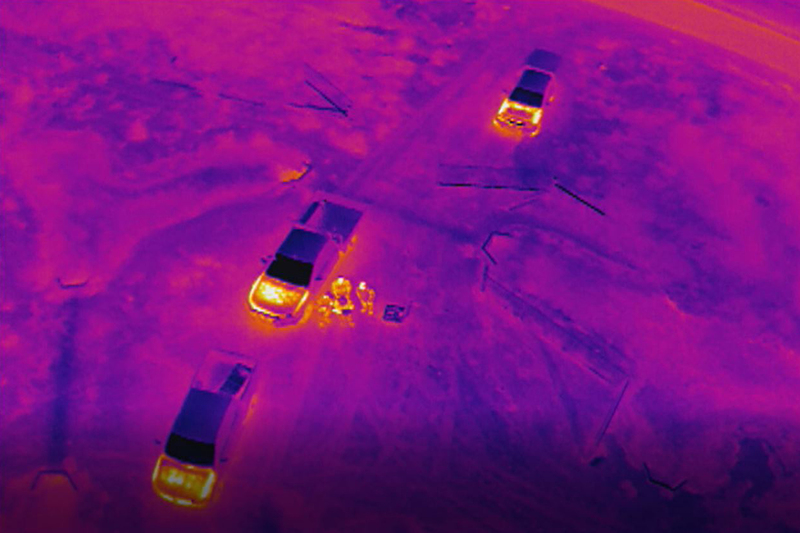 Companies such as Sitemark and CompassDrone have been working collaboratively with FLIR to ensure end users’ input and actionable insights are being taken into consideration for the advancement of these new thermal data sets. Sitemark started as a pioneer in developing radiometric thermal orthomosiacs on a large scale and over the last few years has become Europe’s leading aerial data analytics company, active in more than 30 countries in energy, construction, mining, and agriculture. “It’s thanks to advancements in technologies such as artificial intelligence in recent years that have enabled companies such as Sitemark to develop photogrammetry algorithms combined with various types of anomaly detection, combining thermal and RGB images in unique ways towards industrial applications,” says Vishal Punamiya, CEO of Sitemark. CompassDrone has over 25 years of geospatial experience and seven years of drone mapping consulting. Allowing someone to guide the customer through the process of implementing a drone program can help alleviate a lot of headaches and costs. CompassDrone has designed solutions for specific cases, based on experience. One example is the CIRRUAS app, designed to be integrated with ESRI software for more efficient data extraction. Bundling the correct hardware and software solution is crucial to getting the best and most accurate results. “With thermal sensors, for example, we used to primarily be talking about search and rescue. Now we’re getting calls from oil and gas companies who want to detect leaks and utility companies who need to survey their power stations. New use cases pop up almost daily,” said Jostein Unhammer, Chief Pilot at CompassDrone.